Tattoo removal has been around for many years now, and there have been various different ways and method that people have tried to remove tattoos with. The modern way in which we view laser tattoo removal today, is vastly different from the way in which we used to view tattoo removal. indeed, it is fair to say that it is only within the last decade or so that laser tattoo removal has really gained popularity an is now the go to method for most practitioners when they are faced with a client that wishes to remove an unwanted tattoo. So why do people wish to remove their tattoo? 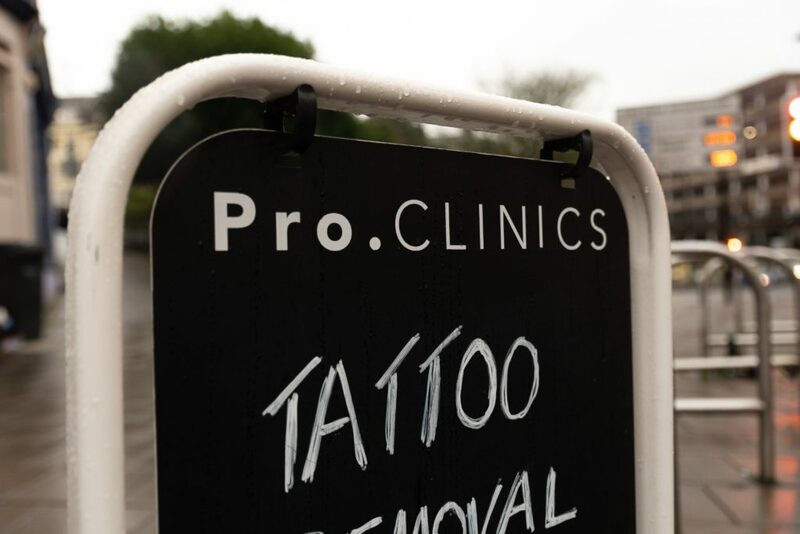 Well there are a million and one reasons why someone may wish to have a tattoo removed, from having a spelling mistake, which can be an unfortunate and all too common mistake! to having an ex partners name removed, as who would want to have a permanent reminder of their ex tattooed onto their skin for the rest of their lives! There are also many people that have a design tattooed and then later decide that they dislike the design and decide that they wish to remove the tattoo using laser tattoo removal. And then there are people who have been in jail for committing a crime, and when locked up are tattooed. These tattoos are usually done using a needle and anything from biro ink, to printer ink! Luckily there amateur tattoos are far easier to remove than a professional tattoo that was done in a tattoo studio by a trained and qualified tattoo artist using correct equipment and professional tattoo ink! Here at Pro Clinic in Bristol, we have been removing tattoos for years safely and successfully using our advanced Q Switched Nd Yag picosecond tattoo removal laser. Tattooing has been around for over five thousand years now, and there is evidence of tattoos to be found throughout the world. Greeks and Romans were often said to use tattoos them to almost brand their slaves and criminals. In addition, there is evidence to suggest that in certain African cultures tattoos were used to highlight social rank, political status, or even their religious beliefs. thousands of years ago, when someone had a tattoo, it really was the case that the tattoo would remain etched onto their skin for the rest of their lives. Due to human nature, it is inevitable that people would one day wish to reverse the process, so tattoo removal started to gain in popularity. Luckily these days, laser tattoo removal is a very tried and tested method of safely removing unwanted tattoos, but historically lasers were not available, so people came up with all sorts of strange and wonderful solutions to removing unwanted tattoos! The brutal and rudimentary methods of tattoo removal sound incredibly painful and often even dangerous!. Using abrasive substances to scratch away the top layer of skin was often used but with very little effect apart from the unwanted side effect of scaring the patient. At Pro Clinics in Bristol, we have seen several cases of clients who have used solutions like these, and have even heard of people using sand paper to try to remove their unwanted tattoos. As you may imagine the outcome of such a crude method can only result in scaring of the skin, and more often than not the unwanted tattoo still remains clearly visible, even after going through this painful and nasty procedure. We have also seen several cases of people who have rubbed salt over their tattoo in order to try to remove their tattoo, and have then also rubbed lemon juice into it! This is not only an incredibly painful thing to do, but also is very dangerous, as it almost always results in unsightly scars left on the individual. Another method that was sometimes used was to inflate a balloon underneath the layer of skin that was tattooed to stretch it out, and then cutting the tattoo out then graphing it with the extra skin. again, you can imagine that the outcome was far from satisfactory. Microdermabrasion was another method sometimes considered to remove the tattoo, which is similar to the previous example of using sandpaper on the tattoo. Luckily things began to change for the better when in 1967 Dr. Leon Goldman, used a Ruby laser as well as a Nd Yag laser to successfully remove a tattoo for the very first time in the history of tattoo removal. As you can imagine, this was break through moment in the history of tattoo removal, and it finally gave people the chance to effectively and permanently remove their unwanted tattoos once and for all. Things began to change again in the 1980’s when some specialists began using CO2 lasers to remove unwanted ink, but that technology was still in fairly new and often resulted in the scaring of the skin as well as permanent pigmentation issues. Also it was extremely painful to undergo the procedure and often required general anesthesia. Finally in the early 90’s things changed again, and laser tattoo removal developed further still into the safe and effective methods that are still used today. At Pro Clinics in Clifton, Bristol, our specialists are now using the gold standard of lasers to remove unwanted ink, the picosend Q Switched Nd Yag laser. This device fires a pulse of energy that is only on the skin for a billionth of a second each pulse, meaning that it safely and effectively breaks up the ink particles without damaging the surrounding tissue. We have invested heavily in this groundbreaking new equipment, and have also spent years developing methods and techniques that are leading the way when it comes to advanced laser tattoo removal. There are a lot of substandard companies offering laser tattoo removal, so it’s essential that you do some thorough research into which clinic you decide to use, as many companies use substandard equipment that will actually damage the skin and can result in scaring. This entry was posted in Laser Tattoo Removal and tagged laser tattoo removal, tattoo removal.